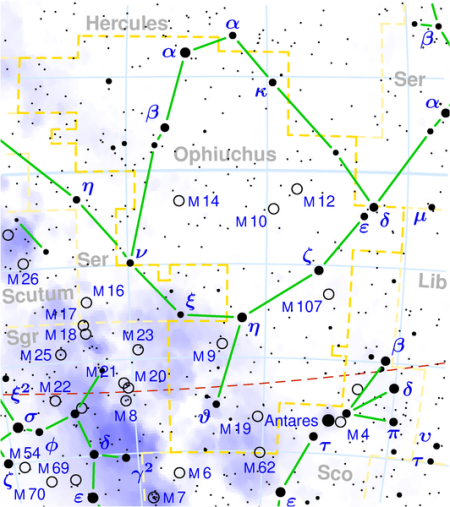 Ophiuchus. © 2003 Torsten Bronger..
Ophiuchus (abbreviation: Oph), the Serpent-Bearer, the mythical healer Aesculapius (his snaked-entwined staff, the caduceus, is the physician's symbol), is a large constellation, in the shape of a huge rough pentagon, mostly of the southern hemisphere, south of Hercules and west of Serpens (Caput). It is replete with bright globular clusters. See below for details of the constellation's brightest stars and interesting deep sky objects. 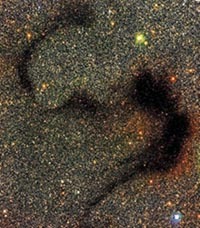 The Snake Nebula (Barnard 72) , also known as Barnard's Dark S Nebula, is a distinctively shaped dark nebula in the constellation Ophiuchus, 1.5° north-northeast of Theta Ophiuchi (R.A. 17h 23m, Dec. -23° 38'); it was first catalogued by Edward Barnard. To its right is B68, an extremely dense dark nebula, and below it are B69, B70, and B74. 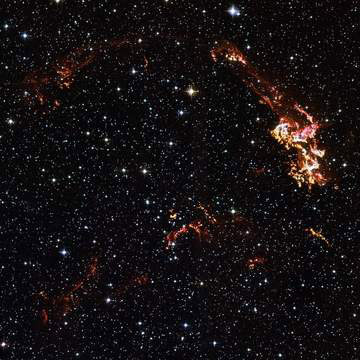 Kepler's Supernova Remnant. Image: Hubble Space Telescope. Kepler's Star (SN Oph 1604) was a Type Ia supernova whose light reached Earth in 1604. The resulting "new" star, which reached a visual magnitude of about -2.2 in late October, was described by Johannes Kepler in his De Stella Nova (1606). The visible supernova remnant consists of a few faint filaments and knots in the galactic halo at a distance of 30,000 to 40,000 light-years, and 4,000 to 5,000 light-years above the galactic plane. Also known as Kepler's Supernova.